Mercury Interactive completed the acquisition of Kintana, Inc. on August 18, 2003 and re-branded the Kintana product line as Mercury IT Governance (ITG), thereby discarding a brand name that was unique, easily googleable, and had achieved critical mass in terms of name recognition. Mercury in turn were acquired in July 2006 by Hewlett Packard who re-re-branded the Kintana product line as HP PPM (Project and Portfolio Management), an acronym for which Google returns masses of pages-per-minute citations, and a name which vastly understates the breadth and capability of the product. As this process is presumably going to continue, and my capacity for remembering and spelling these ever longer aliases is limited, we shall generally use the Kintana name on this site. What does the Kintana Suite do? Dave's quick guide to the application modules. The information agreggated in the portfolio data pool can be viewed as a super project management system, but the objectives of portfolio and project management are quite distinct. The PPM support site has to be your first stop when looking for information or researching problems. The site includes a knowledge base with problems and solutions that you can look up by keyword, complete on-line documentation, downloadable customer contributed extensions such as portlets. You can also submit and review the status of service requests. Click here to sign in to: The Customer Support Site. If all else fails call the HP PPM Support number at 1-800-633-3600. Before you do have the PPM version number and the contract SAID number handy. To get access to the HP PPM support site you need to get registered with HP Passport. You can do it at the above link or read this page for details on doing this! 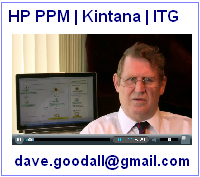 The HP official Portfolio and Project Management site. The official Hewlett Packard site. Getting useful search results for the 'Mercury IT Governance' or 'HP Project and Portfolio Management PPM' brands is quite difficult because unlike the Kintana brand name these are not distinctive keywords. You're likely to get an awful lot of parts per million results. Google does not seem to bring back hits on the pdf files on the HP site. Why i'm not sure as on other searches Google routinely bring back pdf files, but it does seem to be so. This 'Googling for Kintana Information' article suggests possible search strategies. Forums, Discussion Groups, Blogs, Wiki's. There's not much out there but this is what I can find. are trademarks of ChainLink, Mercury Interactive Corporation, and Hewlett Packard Corporation respectively. Back to top | ZDS Home | This article updated April 7 2016.